While essential oils have been used safely for centuries, they are only recently starting to make their way into mainstream healthcare. Using your essential oils safely and consistently will ensure that you see the most benefits. we've outlined a few safety tips for you to help you feel more comfortable when using your oils. For more information on safe uses of essential oils, visit the doTERRA website. WHEN SHOULD I USE A CARRIER OIL? AND HOW? Diluting essential oils with a carrier such as fractionated coconut oil, jojoba oil, or almond oil, can help to avoid any possible skin sensitivities. Simply place a few drops of whichever carrier oil you choose in the palm of your hand and add 1-2 drops of essential oil. In addition, you can create custom roller bottles with a carrier and essential oils to make application more convenient (see our blog post HERE on the amazing dōTERRA Touch Kit). We recommend ALWAYS diluting "hot" oils (like cinnamon, black pepper, and clove) before applying topically. Also, be sure to dilute all oils when applying to children and infants, pets, and anyone who might have sensitive skin. Recent research shows that dilution can actually help your skin to absorb essential oils more quickly and effectively. PRO TIP: When in doubt, dilute! CAN I PUT ESSENTIAL OILS ANYWHERE? Certified Pure Therapeutic Grade essential oils are completely safe for topical use, however it's always a good idea to avoid sensitive areas. NEVER put essential oils directly into eyes or ears. Should you have a need for using essential oils for issues related to eyes and ears, avoid putting oils directly onto or in these areas. For eye discomfort, apply diluted oils around the eye socket or lean over a diffuser for a minute or so at a time. For ear support, apply with a carrier oil to the outside of the ears, earlobes, and behind the ears. If you do happen to get oil in a sensitive spot, remember that water will intensify the potency of the oil while a carrier oil will help to dilute it and lessen the intensity. We always keep extra fractionated coconut oil on hand for such an occasion. DO ESSENTIAL OILS INTERACT WITH MEDICATIONS? 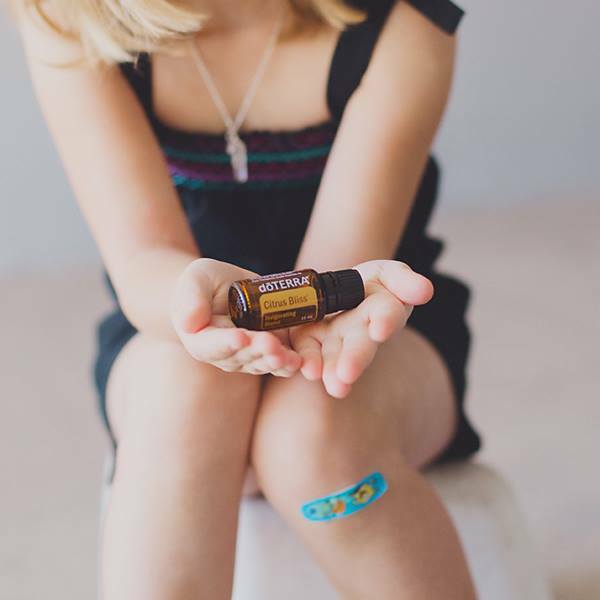 doTERRA's Certified Pure Therapeutic Grade essential oils can be taken internally to help support a variety of needs, and should not impact any other medications or supplements you are taking. However, we suggest you always check with your healthcare provider. To take essential oils internally, you can add a couple of drops to water, smoothies, juices, etc. for flavoring and added health benefits. In addition, you can create your own custom capsule using empty veggie caps and adding whichever oils suit your health goals. We recommend adding a couple of drops of fractionated coconut oil or the children's IQ Mega oil to your veggie cap concoction to help with absorption, though it's not necessary. IS THERE SPECIFIC DOSAGE INFORMATION I SHOULD CONSIDER? Essential oils are best used in smaller amounts more consistently throughout the day rather than in one or two large doses or applications. For on-the-go oil support, we love creating roller bottle blends for topical use (check out these awesome rollers HERE) and carrying around smaller sample-sized bottles for internal or aromatic use (we use THESE).